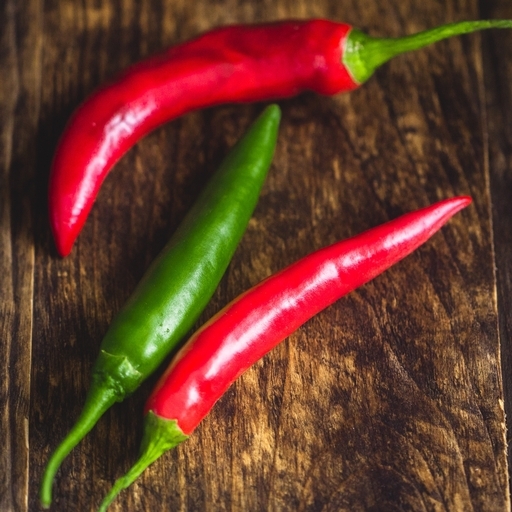 Add fiery heat to your dish with our organic chillies. There are thousands of varieties out there – you’ll get a mix of the best as we pick them. Look out for poblano, jalapeño, cherry bomb, cayenne, purple gusto, vampire chillies and more. During the UK season they might all be green, but will still vary in heat. Taste as you go and add with caution! Chilli, parsley and olive oil are an unbeatable tonic for a jaded palate. Fry some minced garlic and chilli in plenty of olive oil. Add a handful of chopped parsley and mix into cooked linguine or spaghetti. Or, mix a couple of chopped chillies, minced parsley, crushed garlic and a glug of olive oil for a sauce that’s good with scallops, squid, fish or lamb. Store in a plastic bag in the fridge for 1-3 weeks. Fresh from the farm, so give them a wash before using. We’re chilli fiends, growing all sorts of chillies here in Devon, and on Guy’s farm in France.